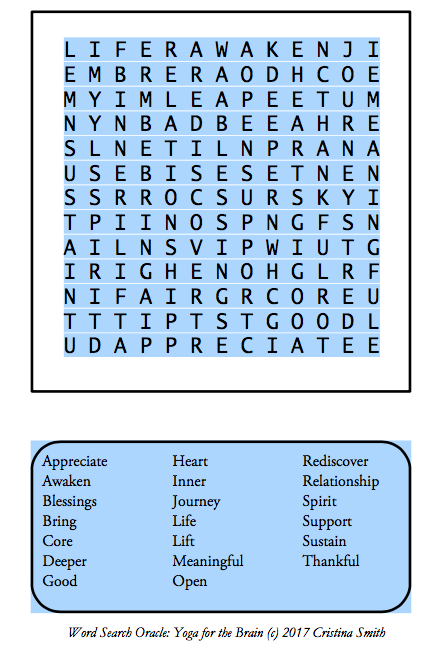 Tips: The object of this game is to find and mark all the words hidden inside the word list below the puzzle. The words in this easy example can be found horizontally or vertically. Download this page and find and mark all the words hidden in the puzzle. Hidden within the puzzle is a secret message created by the letters not used. Place these letters in the blank lines to discover your Mantra. The blessings in our lives sustain us, even when we or someone close to us is in pain or having difficult times. Move deeper inside. Rediscover spirit. Awaken more and more to living in a meaningful relationship with Source. There are many blessings every day. Open to this inner core. Take a look around. There are so many things to be grateful for. Appreciate the good things, the love and joy. Having a thankful heart lifts our spirit and supports our journey.